I’m celebrating today because my first book is hitting the book stores! Please enjoy this preview of the contents of the book, and when you’ve done that, scroll to the bottom for a giveaway! Oh my goodness, guys. Today is going to stand in my memory as one of the most exciting days of my life. Today is the day my book hits the stores and is officially for sale. To celebrate, I want to share one of my family’s favourite recipes from the book: Instant Hummus in a Jar. We are talking about chickpeas canned with lemon juice, garlic, and sesame seeds; everything you need for hummus in one pretty little package. Why is this a favourite of everyone in the house? For starters, we are hummus crazy. As a canner, I love it because it is ridiculously easy to make. As a mom, I love it because my three eldest can make a batch of hummus themselves as easily as cracking a jar, straining a little liquid, and plopping the contents into a blender or food processor. It doesn’t hurt that everyone who has tried it says it is some of the best hummus they’ve ever tried. I’d call that a win/win/win. So let’s chat for just a sec about what makes “Not Your Mama’s Canning Book” a little different than all the other wonderful books on the market. It’s a modern take on canning, to be sure, with a globally inspired collection of canning recipes, but there is more to it; it also contains nearly 40 recipes to make FROM those goods you’ve just canned. Why? Because all the beautiful jars on the shelf don’t amount to any help at all unless you know how to use them! Before I get to the recipe (because it is DEAD easy), I’d also like to share a couple of insider stories about the process of writing and photographing the book. My family was instrumental in getting this book done. Not only did they eat every single thing that went into the book, but they offered actual physical help in making it happen. They schlepped dishes out onto the porch (my preferred place to shoot photos) and back into the kitchen where they bravely volunteered to eat the beauty plate (translation: fought over who got to eat the prettiest plated food.) They held reflectors for me. And hilariously, they held a white board behind the shelf pictured on the cover so I could get a pristine, clean look. This they did 5 times in various permutations as I worked to meet the specifications laid out by my publisher. First, the jars and shelf were taken onto the porch and the board was held by my 16 and 18 year old. Next came my middle son and his best friend on 3 different attempts, one of which was in gale force winds, and -finally- my husband and my middle son held the white board for the money shot. I paid them in food. They did not complain. And about this recipe specifically, I have a story. I had very limited time because I was finishing up recipe development during The Nutcracker season at Neglia Conservatory of Ballet where my son attends AND was in the middle of birthday season for my boys AND it was smack dab between Thanksgiving and Christmas and I generally felt like a crazy woman. It was the one day of the week I didn’t have to drive an hour and a half or make a feast or birthday cake, and I was prepared to put the finishing touches on the Instant Hummus in a Jar recipe by canning one last batch. I gathered my ingredients, went to the pantry, and realized with horror that I was completely out of dried chickpeas. Not a big deal if you live in the city, but friends… I’m in the middle of nowhere. The only place that would carry dried chickpeas for miles upon miles -the Amish bulk food store- was closed because it was Sunday. I was in trouble. I put out a Hail-Mary call for dried chickpeas on facebook, and my long-time, dear friend, Lisa answered with “I have them! I’ll send them home with your kids after youth group!” Oh my word, y’all. What would we do without good friends? Well, we’d be hummusless, for starters. Thank you, Lisa! Instead of gathering a multitude of ingredients, hummus can be as easy as popping open a jar, pouring the contents into a food processor, and letting it go until smooth as silk! Soak the garbanzo beans for 12 to 18 hours. Drain well, then transfer the beans to a large stockpot. Cover with water by 2 inches and bring to a full rolling boil. Add 1/4 cup of sesame seeds and 3 large garlic cloves to each of 6 pint jars. Use a slotted spoon and canning funnel to transfer the boiled beans into the jars, leaving a generous 1-inch of headspace. Follow this by adding 1/4 cup of lemon juice and then top off the liquid in the jar to witihin 1 full inch of headspace by adding the beans' cooking liquid. Use a chopstick to release any air bubbles in the jar and adjust the liquid level, if needed, by adding more bean cooking liquid. Moisten a paper towel with vinegar and use it to wipe the rims of the jars. Place the lids on the jars and fasten appropriately, whether it's turning a ring to fingertip tightness or fixing clamps in place. Process in a pressure canner according to the manufacturer's instructions at 10 pounds of pressure for 75 minutes. Let the canner come back to atmospheric pressure naturally, then open the lid and transfer to a towel-lined rack to cool undisturbed for 24 hours. Remove the rings, wash and label the jars, and store in a cool, dry place for up to 1 year. Pour the liquid from the jar through a fine-mesh sieve to prevent losing the seeds. Reserve the liquid and set aside. Pour the contents of the jar into a food processor fitted with a metal blade or blender. Use reserved liquid to thin, if desired. Well, hello. 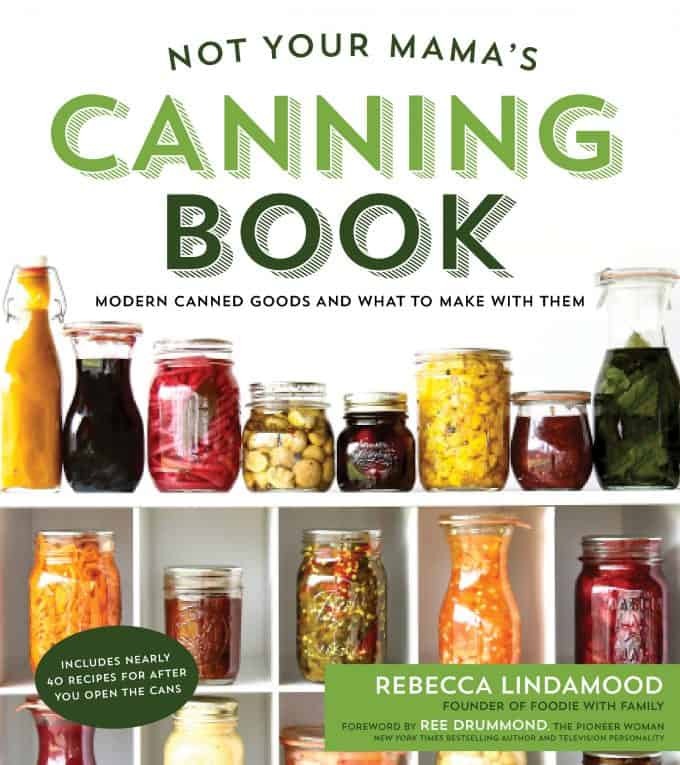 I’d love to give away 5 signed copies of “Not Your Mama’s Canning Book: Modern Canned Goods and What to Make with Them”! I’d also like to throw a new canning funnel with each of those books, if it’s okay with you! So excited to try this recipe and for your new book! Congrats! I love to preserve food,.grew up watching my grandma, uncle, and mother preserve food. Love seeing my canning shelves filled with delicious home preserved foods for the winter months! This recipe looks so good and easy… thanks for sharing! I want, I need, I crave! Congratulations on the book publishing! Yay! As soon as I saw you were publishing a canning cookbook it went on my Christmas list–to give to everyone! I started canning a few years ago and so many of your recipes are on my yearly to-do list now. I’m super excited to see what’s new in the cookbook! Congratulations!!!! I can’t wait to try your hummus recipe! I LOVE hummus and can’t wait to try this recipe. Although I hope I win a signed copy of your book, I will definitely purchase it. You really have creative ideas! We eat hummus ALL.THE. TIME. Not that it is hard to make but having everything ready to go in one jar is genius! Can’t wait to try this! Congrats on the book! Looking forward to getting it! I am making this this weekend!!! Looks fantastic! I can’t wait to read your book! The book will be waiting for me on my porch when I get home. Woohoo!! I Love Canning and can’t wait to get your new Cookbook! How awesome and exciting for you! BOY ARE YOU RIGHT! THIS IS NOT MY MOTHER’S CANNING BOOK. i HAVE MADE THE CANDIED JALAPENOS AND THEY TURNED OUT SO WELL I HAD TO DOUBLE THE BATCH THE NEXT TIME I MADE THEM FOR GIFTS. THIS RECIPE SOUNDS LIKE A WINNER, TOO–CAN’T WAIT TO TRY IT. I love the idea of this! It is so unique! I started canning about 3 years ago and it is the most satisfying hobby. The book looks great. I love to can. I made hot sweet pickled peppers yesterday and I am making Sour Cherry Amaretto jam today. Would LOVE to win this. I’m so excited about this book! Our stove just quit working and we’ve decided to switch over from electric to gas (I hate cooking on electric and am mostly terrible at it!). As soon as that is all done and we have a shiny new stove, I can’t wait to start canning with this book! Congrats!! This looks delish!! I can’t wait to try it! I would love a signed copy of your new book! I am a mother of a two year old toddler tornado and I really want to give canning a try this fall. This recipe is brilliant! Can’t wait to see what else is in your book. Congratulations on completing it – that is some hard work all packaged up into a book. I can every year. Tomatoes, jellies, tuna and more. I have peaches soaking in sugar to make ginger peach jam today. I love canning books. Pick me! It’s been a couple of years since I have canned anything, for the very reason of what do I do with it now. Can’t wait for the book. I have done some canning, mostly jams and chutneys. I’m totally new to canning but excited with these new modern recipes to give it a try!! That is brilliant! The kids eat hummus as fast as I can make it. They would love to just do it themselves and I love the idea of spending a little extra time up front to set it up rather than getting everything out every time 🙂 very interested in learning more! This book will motivate me to try canning. What a great idea of ready made hummus. I love canning cookbooks! I have cherries sitting in the fridge waiting for me to pit and put up! I’m a newbie wannabe. I have dabbled with fruit preserves but I really want to make my own spicy pickled green beans and carrots. I want to make my own pickled vegetables. Just a bit nervous about doing this. Love this idea! Nothing as lifesaving as a ready to go food option for last minute or snack attack time, thank you! So excited for your book, I’m sure it is an incredibly trying project, but how rewarding that you get to see it be born today and to be able to share it with your precious guys. I have been canning and preserving since childhood, first beside my mother and grandmothers, then joining with friends who wanted to learn to can, and now with my children. There is nothing quite as satisfying as seeing all those colorful jars lined up on my pantry shelves. Eating what you have preserved is awesome too. I love being able to grab a jar of peaches or applesauce to round out a meal. Other people love home preserved food too. I have donated baskets of home preserved goodies for various charity actions that have sold for so much more than I expected! Thanks for this wonderful recipe! I can’t wait to try it. Thanks for this great giveaway too! Love the idea of this hummus recipe. Do you have any suggestions when using a non-pressure cooker type canner? I’m an old fashion type gal. How long? Will be putting you book on my wishlist. I am excited to see your approach to canning, because I enjoy your love of food, and how you make complicated recipes less intimidating. Congrats!!!! Can’t wait to dive into this book! I want to learn how to can and have read books and blogs but I haven’t shelled out for the necessary equipment. Your cookbook looks great! This might be the one to push me over the edge to getting canning supplies so I can get started! Do you have recommended products? I do, Gail! Perhaps I should do a post on my recommended equipment. There is a section of the book where I break it all down, though! I’ve been a canner since I was old enough to help my mom. I love all things canned! How exciting and what a great idea for make quick and easing hummus!!!!! I’m really looking forward to getting my hands on your book and this recipe looks great, BUT, I don’t have a pressure canner, I only do water canning. Am I going to be unable to use a lot of your recipes? Congrats on your book! I’m fairly new to canning, just about a year into it and am addicted! My canning cupboard is filling fast with garden goodies. What a terrific idea… we love hummus too..
Congratulations on your book! I’ve always been intimidated by canning but perhaps this could open up a new world for me. I’m a long time canner, taught by my mom, but I’ve only canned basics like tomatoes, green beans, applesauce, peaches and jams. I’d love to try other, fun and different recipes, but haven’t found a trusted source for “good” canning recipes. I think I’ve just found that source! I’ve tried other recipes on your site – love the furikake – and can’t wait to go on a canning adventure with your new book! Congrats on publication! Oh my, I had no idea when I lent you those dried chick peas they would become something sooooo beautiful! So glad I could help out, and I am LOVING reading through my copy of Not Your Mama’s Canning Book! It is GORGEOUS and packed full of wonderful recipes. This is really going to spice up my 30+ years of canning! Awesome idea. I love hummus and it’s not hard to make any time, but this would simplify the process even more. I haven’t done a ton of canning, but have enjoyed the products I have made (I’m looking at you Candied Jalapenos)! I have water bath canned, but never used a pressure canner. I did ask for one at Christmas and my honey happily obliged!! ( makes his life easier when I tell him what to get me! ) So I plan on using it this year, your hummus sounds like it would be a good first recipe to try!! Thanks!! Late to the game here, but I’m wondering how safe this would be. The manual for my pressure canner states, “WARNING: Do not use pressure canner on an outdoor LP gas burner or gas range over 12,000 BTU’s. Doing so may result in damage to the pressure canner and/or property damage and personal injury.” It’s a Presto brand canner, with dial. Do you know if this vulnerability is universal, or style-specific? As an aside, I just ordered your book from Amazon. I’m a fan of supporting the hard work and dreams of others, and this is right up my alley… thanks for sharing your expertise! Congratulations on your book publishing! I’ve followed this blog for a few years now and love all of the recipes I’ve tried from here. Excited to try out some of these canning recipes! I love to can jam and jelly and salsa verde….love the look of your cookbook. Congratulations!! This looks like an amazing book. I love canning and trying new variations on things. What a brilliant idea! I can’t wait to try this one. I love making hummus with sesame seeds instead of tahini already, this makes it even simpler. I used to can years ago, but mainly just fruits or jams. I love the way your whole family gets involved. I really enjoy the recipes you post. Hummus is one of our favorite lunch foods, so I can’t wait to try this recipe! This Hummus looks greats, I cant wait to try it. I cant wait to see what new and exciting recipes you have in your cookbook. Congratulations, Rebecca! What an accomplishment! I’m an avid canner and lurker on your sure- so much deliciousness. I’m excited that you include pressure canning recipes. I’m new to pressure canning (awesome Christmas present from my husband last year) and dont have the confidence to branch out in my own with it yet (eek- botulism). Thanks again for all that you do! This is a fabulous idea can’t wait to try it! I’m a total “wannabe”! I’ve always wanted to try it but have been too timid. I’d love to win your book and try it out for myself. Thanks for the generous giveaway. sounds great! I’m going to have to try that for my holiday gift baskets! And congrats on the new book! I love the blog andI’m sure the book will be great too! Your’s is my favorite foodie blog, and about the only one I bother to read any more! Thanks for always delivering up fun, tasty, unique, REAL food recipes. I’m not a canner, but I grew up with a mom who was. It’s on my list of things to learn to do. I figure you’re book is the best place to start 🙂 So happy for you, Rebecca! Thank you so much, Patty! That is so sweet of you to say that! I’ve yet to start pressure canning, but love your recipe for Thai sweet hot sauce and the pickled carrots. First of all, congratulations on your book! I did a lot of canning when we lived on a ranch in Montana. Now that it’s just my husband and me, I don’t can anymore but your book has me itching to get the pressure canner out. I only can a few things, apples and strawberries, but it is so much fun! Congrats on your book!!! 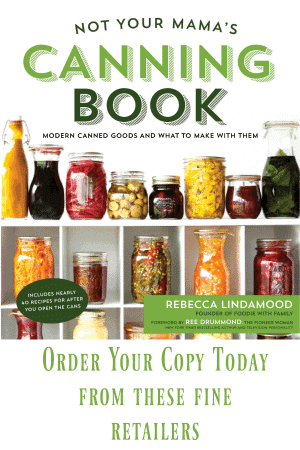 I’m a novice when it comes to canning so this book would be great! With five boys of my own it is always a challenge to have enough quick snacks around so I’ll take all the suggestions and help I can get! This recipe alone may make me finally buy a pressure canner. Soooooo excited to read your book! I am a mom of 4 young kids and am always looking for ways to store things they will eat. My grandpa canned his own pickles but I have never canned myself yet. Can’t wait to try this recipe and can some hummus!! Longtime troller of this site,so happy for you to have published a book! Congrats! I love this website. I love to can and I cannot wait to see the recipes in this book!! The hummus recipe sounds great!! The book looks beautiful! I might even have to get a pressure canner now…. Congrats on your book! Excited to read it and try some new canning recipes. I’ve been canning for a few years now, having taught myself to water-bath can one autumn when the local apple trees produced the largest crop of the most lovely apples I’d ever seen, and I couldn’t resist gathering as many apples as I could from as many trees as I could get access to. Unfortunately, I’m the only one in the house who eats preserves, so I end up giving away the jars I don’t eat or use in baking. Love the idea of a book that has ideas for using those precious home-canned jars! I would love this book. I own many canning books and can alot of our garden for the winter. Thanks for writing this cookbook and giving away copies! Your book looks amazing! I love that you’ve added recipes to use up all those beautiful preserved foods. I love the idea of canning “hummus”. Thanks for sharing your creativity with the rest of us! Congratulations on your book! My loves hummus and to have it in a jar and ready on hand sounds wonderful! I love canning and just came across your site after reading The Pioneer Woman’s post about making fresh mozzarella! Your new book sounds awesome and I can relate with your whirlwind since I have 3 boys of my own!! I will be trying this recipe since we love hummus!! The hummus sounds delicious! I’m sure I would love many of your recipes. So excited about your new cookbook! I’ve not tried my hand at canning yet, but just the Hummus recipe above has inspired me to give it a try! 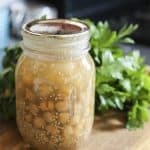 I know it’s a probably a silly question (I’m a canning newbie), but I have a ton of canned chickpeas I need to use up. 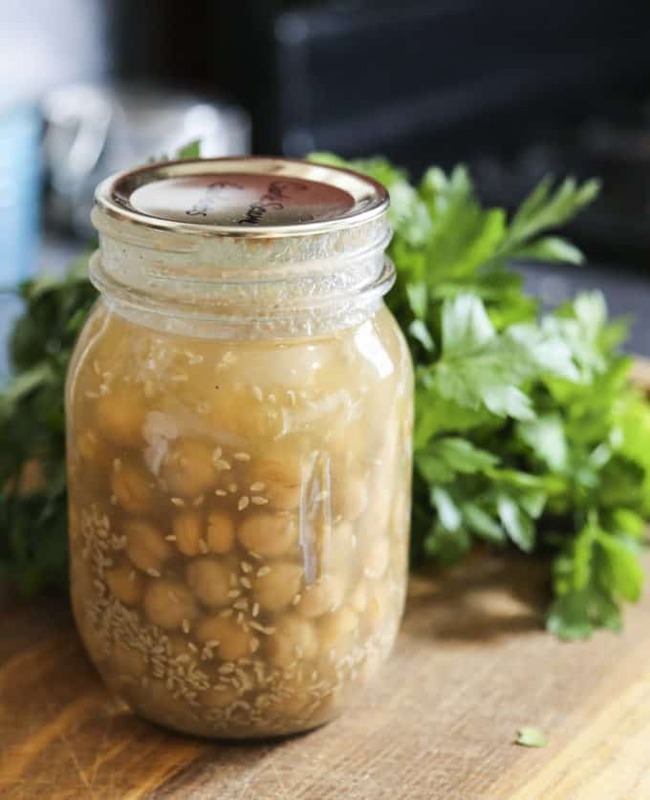 Would it be possible to use already canned chickpeas in this recipe? Hi Kaylee- Good question! Unfortunately, pre-canned chickpeas won’t do the job here. They’ll just turn to mush in the pressure canning process. Fortunately, those are great in the chickpea tikka masala recipe in the book 😀 Additionally, dried chickpeas are tremendously inexpensive, so that’s a bonus! Hey!!! Who won??? Let’s congratulate them!!! HA! It’s in the widget itself above. Ok….you know I love ya more then my luggage (name that movie) but there any nuttin’ in the widget……..Just says, “This competition has ended”……teehee…. Hrm. It was supposed to be there. Ah well, I’ve sent emails to all of the winners a couple of days ago. I’m sorry! This is a wonderful idea! AND, I’m able to buy locally grown chickpeas to make this! Question – I don’t have a pressure cooker – is it possible to can these without a pressure cooker and if so, how long? Thanks! If you have a blender the blending attachment will fit on the jar. So pour out most of the liquid, place the attachment on the jar and process. No food processor needed. That is a great idea! Unfortunately, my blender won’t work that way as the blade is housed permanently in the carafe, but I can see how that would work for other models! 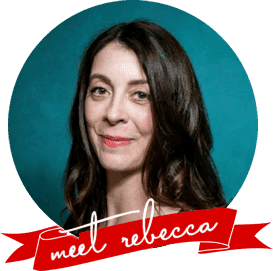 Hi Rebecca, I got your lovely book as a birthday present and it has quickly become my go-to.. Thank you! However I tried making this hummus recipe last night and my results are different than I’d expected.. I am quite sure I followed the recipe, I used (dried) chick peas that had soaked for 30 hours with two changes of water, I didn’t cook them though first (just brought the pot to a boil).. I was wondering if I should have cooked the peas fully first? The liquid in them is white and the whole thing seems quite solid.. bet it still tastes good, just not near as pretty as yours.. 😊 I will open one up later see what it does.. Bet I can strain the gelly liquid out and use it just the same.. I would like the pretty and liquid result that you have though, I am not sure if mine will last well as they are..
Hi Erin. Thank you so very much for your kind words. I’m so glad you’re enjoying the book! Let’s see if I can set your mind at ease. If you heat the jar up slightly in a bowl or pitcher of warm water, yours will also look like that. What you’re describing is fairly normal and it doesn’t sound like you did anything wrong. The jar that was photographed was still in the cooling down phase and hadn’t been out of the canner more than 24 hours. The beans continue to cook (even if ever so slightly) until they’ve cooled down completely even to the center of each bean. As they do that, they’ve giving off starches and that’s what thickens your liquid to a gel consistency. It isn’t harmful at all and won’t effect the shelf life even a little! Oh excellent! So good to hear! I will share a couple with my mom with confidence! Hi there! No worries. The photo shows the jar straight out of the canner and not after it had chilled completely. When the jars are at room temperature, they definitely look jellied. You’re a-okay! I’m excited to make this! Borrowed the book from the library, and realized in no time I’ll want to buy a copy. I even got my pressure canner tuned up so I can do this recipe, but first, one question, how long do you boil yer beans? I canned this recipie yesterday and opened a jar to try today. I REALLY wanted this recipie to be great as I wanted to use it for Christmas gifts. Unfortunately, I won’t be able to. The flavor is just OK but not as good as hummus that uses tahini. The sesame seeds don’t grind up smoothly using either a food processor or blender. I added some salt and more garlic when putting it through the food processor, which did help some. Wish I hadn’t made a double batch. I won’t make this recipe again. That’s interesting! My sesame seeds blend up perfectly smoothly when I make it. I’m sorry it didn’t work as well for you. And the recipe deliberately goes a little light on garlic and salt in the jar because it’s always easier to add than take away! If you’d like a stronger tahini flavour, that can also be added while in the food processor! Were they hulled sesame seeds? I’m just so curious because no one has ever reported them staying whole before. The act of pressure canning them softens them up already, so it is very odd that they remained whole while the beans did not. Very interesting…. hmmm… your recipe is the first one that popped up on google, and I was transfixed. I just bought a HUGE can of garbanzo beans at Costco, and have a bunch of tahini left over… I wonder if I can replicate this, with the tahini and adjusted liquids, to make for gifts, for my non-cooling friends and relatives…. most wouldn’t have a fine sieve… so i think I need an arrangement for just a food processor. Any thoughts? Hi Lisa- I don’t think the canned garbanzo beans will work for you in this case, unfortunately. They’re already processed and just wouldn’t hold up to being re-processed. Additionally, nut and seed butters are not considered suitable for any kind of home canning, but rather should be added at time of use. Just discovered your fantastic canning book and now this website. Rebecca you are amazing – and the recipes in the canning book are so innovative and attractive. I spent this afternoon making the Instant Hummus in a jar – and the Mushroom Soup concentrate – and earlier canned the Tikka Masala sauce. I love your use of herbs (herb-bombs – amazing!) and spices (an American with a taste for Indian cuisine – splendid!) – so thank you, thank you, thank you, for all your hard work and innovation (and sense of humor!) that makes this book one of the best cookbooks/canning books/food preservation books I have ever owned! Absolutely Rebecca – it would be my pleasure! Hello! Thank you for the great idea. I made this according to your instructions and after processing there is very little water in my jars and the beans a he sesame seeds are not immersed in fluid. I weighed the beans on a scale prior to soaking them, and I pa ked them in the jars leaving one inch of headroom. Are these going to be safe to eat? Happy New year! Will garlic turn green after canning?